When I brought Marrakesh and Gina home last Saturday, he seemed firmly on the mend. He was running, bucking, napping, eating- all the things you expect a two-and-a-half week old foal to do. The vet had sent us home with five days’ worth of antibiotics, and Johnny and I dutifully administered them morning and night. I also took Marrakesh’s temperature every day to make sure he wasn’t feverish. The vet told me to call the clinic if he spiked a fever, had loose stool, or became lethargic. On Tuesday morning, his temperature was slightly elevated. I called the clinic as instructed and spoke with my vet. He thought the increase in temperature might be due to the increased heat outside. (The heat index was over 100°F for the first time in a few days.) He advised me to bring Gina and baby inside, sponge baby off with water and rubbing alcohol, and park them under a fan. I did, and his temperature decreased to within normal range. However, on Tuesday evening, Marrakesh developed diarrhea. Not the kind-of-runny-but-still-recognizable-as-poop kind. The is-that-pee-wait-he-doesn’t-pee-from-that-area kind. Still cute, even when he’s not feeling his best. The diarrhea persisted through Wednesday. Marrakesh became less active. After consulting with his vet, I stopped the two antibiotics he had been receiving and switched him to a different one. I also began giving him probiotics. He remained lethargic and wasn’t nursing very well. On Thursday, the diarrhea stopped but he still seemed tired and uninterested in doing much other than lying under his fan. On Thursday evening, my friend next door noticed his eyes were sort of cloudy and oddly tinted. 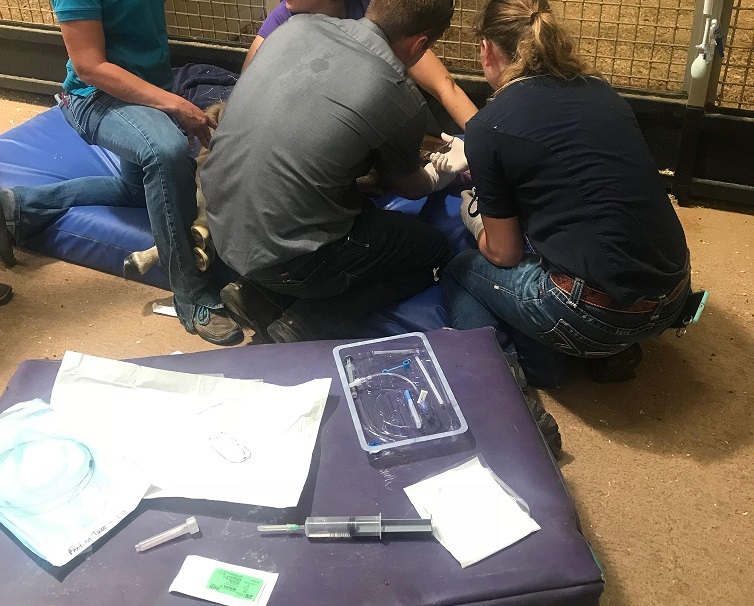 She texted the vet who treats our adult horses (and works at the same clinic as Marrakesh’s vet); she suspected fibrin formation in his eyes and advised applying atropine ointment and administering banamine. On Friday morning, I called the clinic to discuss Marrakesh’s eye ailment and continued lethargy. They felt it was best if I brought him in, so I did. The clinic ran a blood panel on him, which unsurprisingly showed all sorts of wacky values. The vet felt most of the values were due to dehydration and diarrhea. So in went another IV catheter and another NG tube so he could receive fluids and milk. The cloudiness in his eyes was attributed to fibrin, which was forming as a byproduct of the ongoing bacterial infection. The vet felt it would clear up with treatment. Marrakesh’s team putting in the IV catheter and NG tube. He’s under there somewhere! I last heard from the vet on Saturday. Marrakesh was about the same as he had been on Friday- not feverish, but still lethargic and not nursing well. The diarrhea had also returned. The vet planned to run another blood panel on Saturday afternoon to see if any of the fluids he was receiving needed to be adjusted. I’m trying to remain optimistic. I know he’s in good hands at the clinic, and I know his vet (and the rest of the staff) want to figure out what’s happening and why. 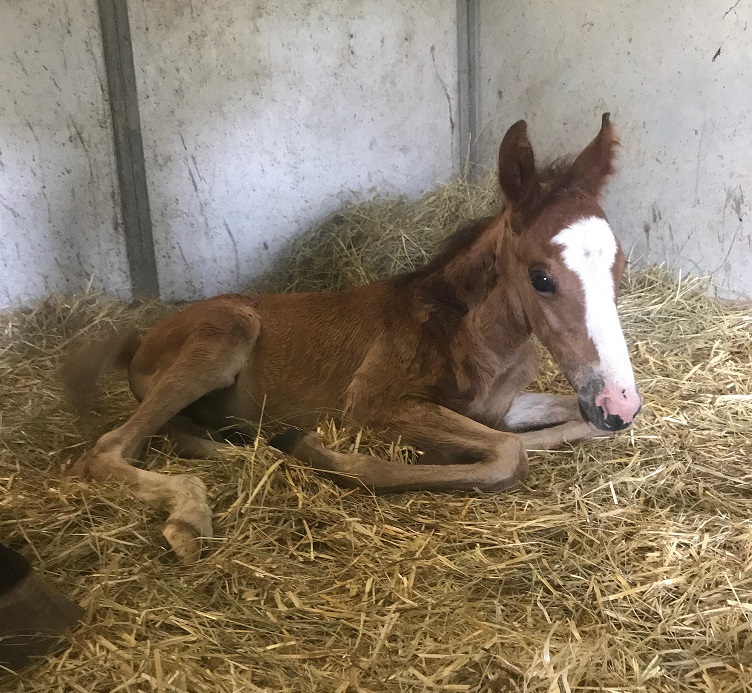 This certainly isn’t how I anticipated breeding Gina would go, but hopefully her colt will recover and go on to live a happy, healthy life! Poor tyke. Hopefully he is firmly on the mend soon! I hope so, too! I look forward to a day when he can just be a regular baby horse! Jeez, I’m sorry this is happening to you guys. I can’t imagine how stressful it must be. 🙁 Hopefully he’ll rally again and they can get everything under control. It sounds like the vet thinks if they can keep him hydrated, medicated, and fed, he’ll gain strength and his body will be able to fight off whatever’s plaguing him. I sure hope so! ugh this must be so stressful for you, i can’t even imagine 🙁 i hate seeing an animal sick, and hate it even more when we can’t be totally sure why it’s happening. fingers crossed baby M turns a corner soon ! It has been stressful and sad and frustrating all at the same time. I’m staying positive, though! His team is experienced, knowledgeable, and I know they want to figure out what’s going on just as much as I do. I don’t know how you’re not camping out at the vet clinic, because that’s totally where I would be. time to get better, Marrakesh! Haha, I have to log some hours in the office so I can pay off his increasingly alarming vet bill! Not gonna lie, I’ve totally thought of that… I wish I were closer so I could bring you a casserole or something. That’s what you do when you have a new baby, right?! Ugh. This is so frustrating and heart wrenching, and all of those other adjectives. I’m so sorry you’re all going through this. I hope they get this figured out soon so he can get back to being a naughty baby out in your field! Ugh, come on buddy! We’re all rooting for you! Sending good vibes, I hope he makes it through all this drama unscathed and that you get a release from the roller coaster soon. Sorry to hear you are going through this. My thoughts are with you and your animals. 🙁 I hope he pulls through soon! Poor baby, so hard when they only have those tiny, new immune systems. Jingles for a fast recovery. I’m so bummed to read this update! I sure hope that he’s doing much better now. I’m so sorry you’re going through all this. It really stinks.